I looked over at my wife Helena, in the passenger seat. PETE'S A FAN: Gettit? Pizza fan. Never mind. "I'm pretty excited," I said calmly. "You might," she warned, "be disappointed." That exchange took place at 2:10 this afternoon. I'm not joking about being excited, not one bit. As weird as this might sound, we were on our way to a place called Marconi's Pizzeria, and I'd been fantasizing about the trip--way more than you might consider healthy-- since April. Back in mid-April, I was editing away at my new job when my cell buzzed. The caller I.D. read: "Roman." Roman Stankiewiecz. I've known him since--I believe--grade one. The Stankiewieczes--they had six kids and Roman was my age--grew up on Whittaker Street, one block west of the house where we Carters lived. And although Roman and I have kept in contact-ish, it's not like we see each other regularly. We've gone for years without talking. So when his name came up on my screen midday like that, I got a little worried. We're at that age, right? I wasn't taking notes but I can recap with some accuracy what he said, and it was this: "Pete. How ya doin'? Listen. Mike said I had to call you." I knew right away he was referring to Mike Blondin, another guy we've known since grade two. His mom had four sons, Bill, John, Joe and Mike, who was my age, and they lived up on Stanley Street, a few blocks north of Roman. "Mike and I just had pizza at this place called Marconi's near Cawthra and Burnhamthorpe and you know what Pete? "It is almost as good as Don's!" I could almost hear the exclamation mark. Pizza comparable to Don's. That is well worth the alarming mid-day phone call from an old friend. 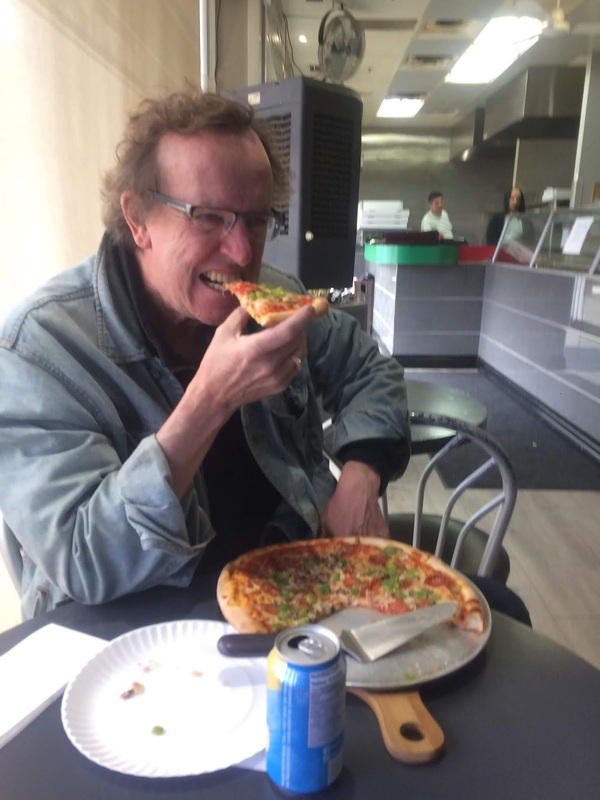 When we were growing up in Sudbury, out of a little renovated garage half a block south and another half block east of our house, our classmate Paul Uguccioni's father Don ran Don's Pizzeria; and for us west end Sudbury kids, Don's pizzas set the standard by which all subsequent pizzas would be measured. Don's little pizza shop as we knew it moved to a bigger, fancier location some time when we were in high school. And then it changed hands. And although there's still a Don's Pizzeria in Sudbury, I cannot vouch for it one way or the other. never change, like the jean jacket I'm wearing in both pics. 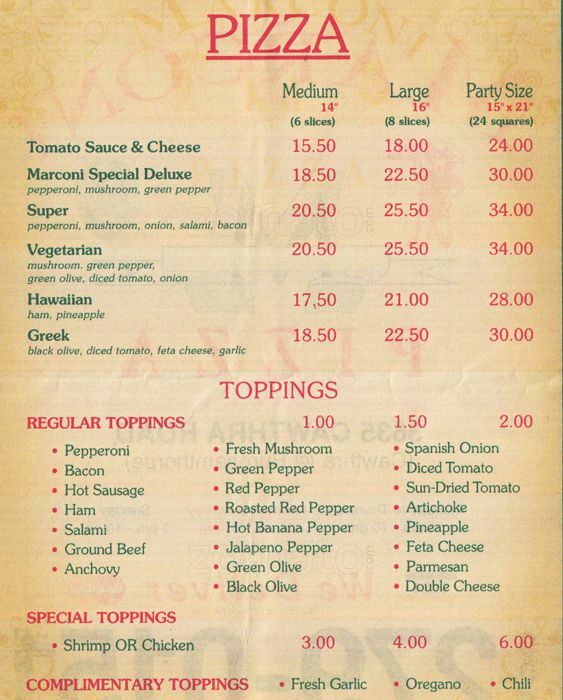 All I know is that original pizza experience is something that a lot of old west-enders have been searching for more than half a century. When Roman called me, he also happened to mention that it was me--all those years ago--who introduced him to pizza, at Don's. When he told me, I was really touched. Then a few weeks later, I was telling our other friend Trevor MacIntyre about the call, and he said the same thing. He hadn't had pizza until he and I went to Don's together. I felt honoured, like I'd led them on their first lion hunt or something. And Trevor reminded me we used to split a small pizza with just sauce and cheese, and it cost 95 cents. By our reckoning, we were probably in grade four. Grade four. Going to a pizza shop by ourselves. I just realized something else. I spelled Paul Uguccioni's surname right on my first try. And I haven't written that name for decades. Now that I'm thinking about it, not only were Paul, Mike, me, Roman and Trevor friends, we were altar boys together; we played scrub baseball together and all grew up in this funky Sudbury neighbhourhood and we were able to "hang out" at the local pizzeria when we were, like, 10 years old. Unsupervised. Maybe there's something beyond Don's distinctive tomato sauce and spices flavouring my memories. Just maybe. I'm not the kind of guy who hearkens back to the good old days, because like my dad used to say, "the best thing about the good old days is that they're gone" Our childhood days were anything but blissful and innocent; we just like to think they were, which is probably a good thing. Since those Don's Pizza days, Roman, Trev, me and Mike have done some stuff and been a few places. A lot of pizza has been consumed. And with every bite--it turns out--we've been comparing whatever was at hand to that original, perfect, Don's. 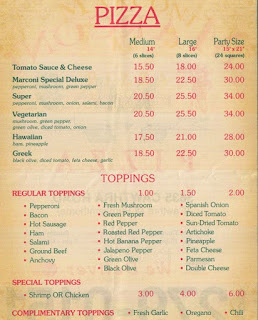 My quest for pizza as good as Don's once took me to downtown Rome, Italy. A Newfoundlander named Keith Something and I went to so many pizza joints and drank so much red wine one night that before passing out we followed the ancient Roman orgiastic tradition of hurling everything we'd eaten and drank back into the Tiber River. I recall the guy whose restaurant we'd just exited standing behind us, yelling in Italian. I think he felt insulted. "It's sorta been like chasing the dragon, hasn't it?" And that's why I was so excited driving out to Marconi's this afternoon. If Monty Python were making a movie about our trek to Marconi's they would have clapped coconut shells together. Pizza as good as Don's has been our holy grail. Arriving at the strip mall parking lot, I felt a bit giddy. Like I imagine my devoutly Catholic mom would have been, pulling into the parking lot at, maybe, Lourdes. We walked toward the storefront. Pizza boxes were stacked 15-high. Very Don-ish. The grey-haired aproned guy who greeted us from behind the flour-covered counter could have been Don for Pete's sakes. This bordered on eerie. The proprietor (son in law of the original owner) served it to our table. So far, so good as Don's. As tempting as it smelled, I waited. Maturely, I might add. Then I took a bite. And a second. The crust was thin and moist. The ratio of tomato sauce to mozzerella? Perfect. Not too heavy on the spices and completely devoid of any designer-pizza fakery like broccoli. Marconi's Pizza is really really good. This was one of the best pizzas I have ever had in my life. Roman's assesment was 100-percent accurate. Marconi's pizza is, "almost" as good as Don's.